When you move to South Florida one thing is a constant - you are going to have guests! However with our crazy real estate prices who has the space for a dedicated guest bedroom? Compact Lofts, Tiny beach cottages and petite condos are more often the norm. Fortunately, there are a number of excellent solutions. Sofa Beds, Futons, and Murphy Cabinets have come a long way in the last few years. However, knowing which one is right for you can be a challenge, especially if you are shopping online. We have put together a guide based on the type of problems our customers are trying to solve. We hope this will help you find the right choice for your situation. 1. The Cubed Sofa - When you are short on wall space. Number one on our list is the Cubed Sofa Bed from Innovation Living. This has to be the top choice for those who are short of wall space. Cool, contemporary styling plus its compact size make this a popular choice for Miami fashionistas. The Cubed gives you lots of choices; Available in either Mixed Grey or Mixed Natural with Walnut or Chrome legs or matching upholstered arms, and works well in contemporary or mid-century modern interiors. The Cubed has long been a popular choice for those looking for a compact Full or Queen size guest bed, This is great news as a compact sofa sleeper that has style and comfort is hard to find. The full and queen size will sit 2-3 people and are about the size of a medium loveseat. The full size opens to a generous 55 x 79. This makes it 4" longer than a conventional full size. If you do not have room for a queen size your tall guests will thank you for those extra inches. Do not worry about finding extra long full-size sheets, most deep pocket sheets will stretch to accommodate the length. The queen size is the same as a conventional queen size bed. Danish design, the No-sag spring base, and tough upholstery fabrics ensure this sofa is built to last. 3. The Cassius Deluxe Excess Sofa Bed - When you are super popular. The Cassius Deluxe Excess Queen size Sofa Bed is our top choice for guest beds that get a lot of use. This sofa bed opens into a true Queen size bed. When you look at other sofa beds and futons you realize what a brilliant feature this is. Queen size futons and sofa beds inevitably have either a deep seat or a high back. Think about it, that extra 5" in length has to go somewhere. Full-size sofa beds are just not always spacious enough for your guests, and you want them to be comfortable. The Cassius Deluxe Sofa Bed gives you the best of both worlds; the compact space saving features of a full size with the extra length of a queen. Manufactured by Innovation Living the Cassius is from their Slider Collection. The sofa beds in this collection get top marks for ease of use. Even your older guests should have no trouble opening and closing this sofa bed. If you love this sofa bed but you need to save on space, these clever Scandinavians have thought of everything; it is also available without the arms on the side, still giving you the same Queen size bed. In the collection this is called The Supremax Deluxe Excess Sofa. The standout feature's of this sofa bed has to be the individually wrapped pocket spring 10’ mattress; The 10” pocket spring is of a quality found in high-end conventional mattresses. Contemporary style sofa beds tend to be on the firm side but this mattress has the support and just the right amount of softness. This sofa bed was designed for the European market where many city dwellers sleep on their sofa beds every night. The Cassius is certainly up to the job. Available in Kenya dark Taupe, Mixed Natural or Mixed Blue with chrome legs this sofa is styled for the swankiest condos. If your living room is also your guest bedroom this sofa will not look out of place. 5. The Key West - When your style is Coastal. The Key West has all the flexibility of a traditional futon sofa bed. Available as a Full Sofa , Queen Sofa, Full size Lounger and a Twin size chair, this futon is made for cute beach front cottages. As with most futons you can select the mattress that is appropriate for the amount of use you expect the sofa to receive. Add storage drawers underneath where bed sheets can be kept at hand ready to make up the bed when unexpected guests show up. Removable, washable indoor/ outdoor covers are available in all the latest beach colors and prints. The fabrics below are a sampling of the many coastal covers and pillows available. 2. The Clover Murphy Cabinet Bed - When you just want to hide it away. What a great idea! If you do not wish to add seating to your multi-functional room the Murphy Cabinet Bed is the answer. Designed to blend with home office furniture the Clover cabinet comes in White, Cherry and Chocolate finishes. As popular as it has become, 3 new coastal finishes and a contemporary grey cabinet have been introduced to the collection. This very cool concept only needs a slim 5 feet of floor space when folded up and will fit in small rooms. Unlike traditional Murphy Beds, the Murphy Cabinet bed is free standing so there is no need for costly installation. If you move simply lift it up and take it with you. Another plus is it sits higher in the bed position than most Murphy Beds. Handy for older guests. Manufactured by Night and Day Furniture they seem to have thought of everything. There is a built-in power/ USB port on the side so your guests will have an accessible power point. No more crawling under the bed to plug in the laptop. The large drawer holds bed linens and can be reached in both the bed and upright position. Flip up night tables on each side of the bed give guests a place to put easy to reach items. The mattress is made of premium Cool Gel Memory Foam. An especially nice feature here in Florida. This might be the most comfortable guest bed on the market. 4. Bahama Rattan Futon Sofa - When your style is Tropical. If you have a tropical style home; the Bahama Futon Sofa is for you. Featuring Banana Leaf arms this sofa whisks you away to balmy South Beach resorts. True futon sofas come with a bunch of options, and the Bahama is no exception. Available in 4 sizes; Queen Sofa, Full Sofa, Full loveseat, and Twin size chair this guest bed can be configured to fit your space. Picky guests? Not a problem, the Bahama is offered with a choice of 6 different mattresses. Keep in mind, when you buy a futon, covers are typically sold separately. This is a feature you either love or hate. Those of us who live to decorate go wild with all the incredible tropical futon covers available. For the design challenged it can be a little overwhelming. Not to worry the design-nerd sales people at The Futon Company love to help. 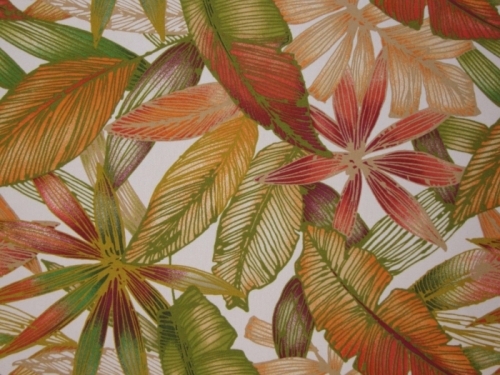 The fabrics below are a sampling of the many tropical covers and pillows available. 6. The Seagull Daybed - When your guests need separate beds. When not all your guests are couples a daybed is the perfect solution. For a Florida look it would be hard to beat the Seagull Daybed. The trundle sits on the floor and can roll all the way out to become 2 separate Twin size beds perfect for 2 kids. The option is available to purchase with a pop-up trundle instead of the roll out trundle and this will give you a king size bed but for some these can be hard to operate and you loose the beauty of the wood trundle and would have to do a fabric skirt instead. 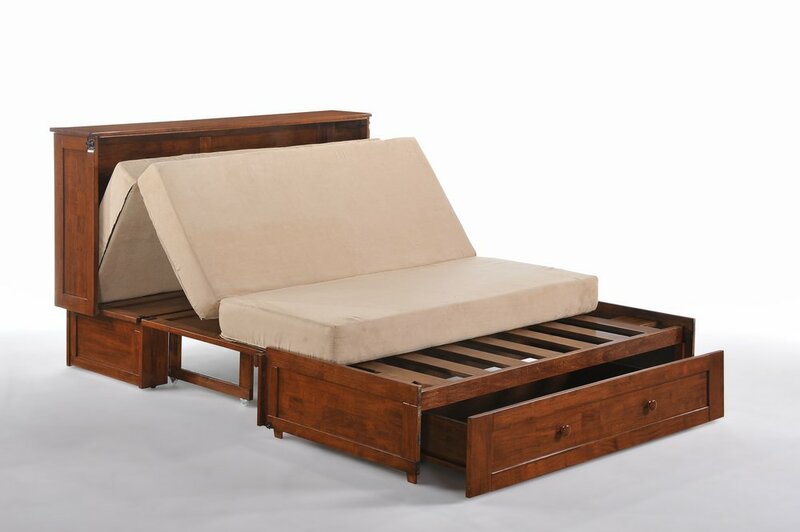 If storage is a priority, the daybed can be purchased with 2 easy roll under extra deep storage drawers instead of the trundle.